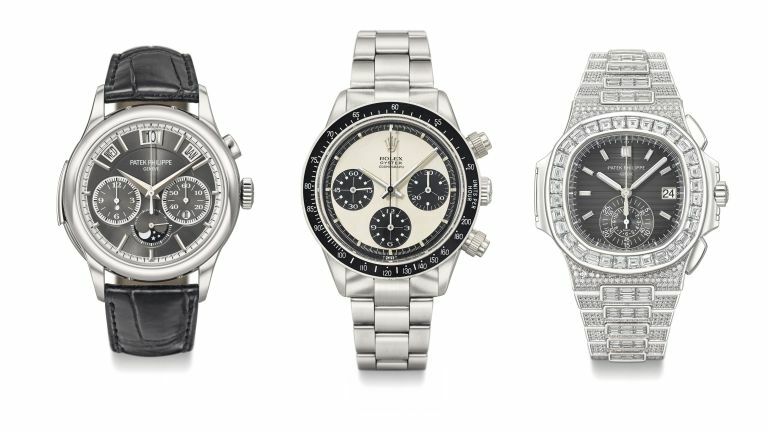 Hot on the heels of Philips' Rolex Daytona auction, Christie's held its Rare Watch Auction at the Four Seasons Hotel des Bergues in Geneva on 14th May. The auction included a number of watches from Rolex, Patek Philippe, and Richard Mille, with sales totalling CHF 12,241,750 (around £9,000,000). The most expensive watch in the sale was the Patek Philippe’s “Grand Complication” reference 5208P selling for CHF 750,500 (around £500,000). It is one of Patek Philippe’s most complicated wristwatches ever made, and offered exclusively to the firm’s top clients. The piece was preserved like new, and the platinum reference 5208P is only the second example to come to auction. The sale also included two Richard Mille watches – RM011 R. Grosjean Lotus F1 Team, which sold for for CHF187,500 (around £140,000) and the RM030 Argentina Especial Limitata No.26/30, which achieved CHF 118,750 (around £90,000). Sabine Kegel, Head of the Geneva Watch Department, commented, “The balanced offering of vintage and modern watches was well received by all, including bidding via Christie’s Live, which increased by 1/3 compared to November 2017. Disappointed you missed out? The next rare watch sale is in Hong Kong on 28 May.